It is hard to believe that another summer is almost over and we are looking toward Autumn. 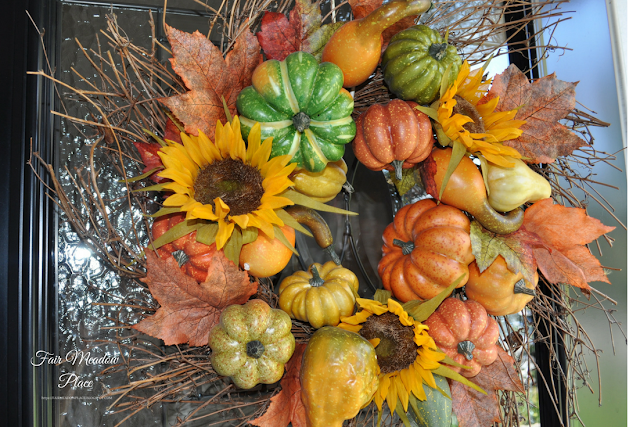 The summer wreath was replaced with a twiggy grapevine wreath. Faux gourds, mini pumpkins, and faux sunflowers and fall leaves were wired and glued to the wreath. 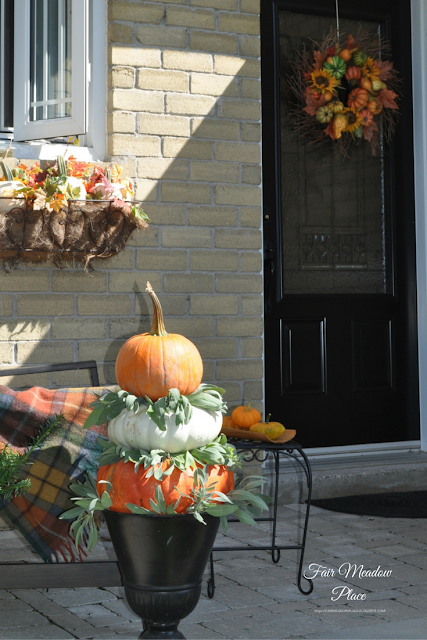 We decorated the door, the window box, and the bench and placed a pumpkin stack next to the bench. The made in Scotland tartan blanket is Buchanan Antique. The 'antique' part of the name doesn't mean that the blanket is antique, but rather the colouring of the blanket is muted making it look antique. 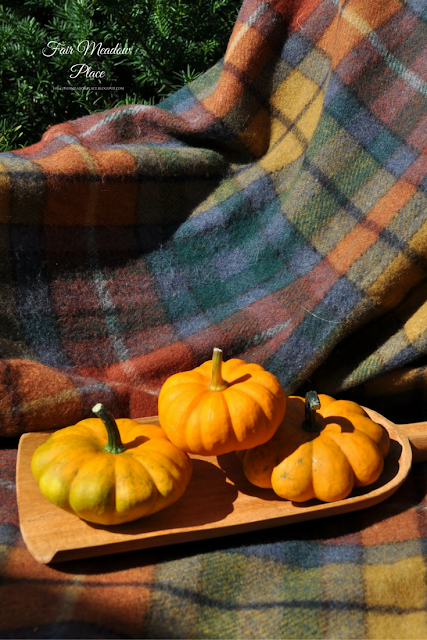 The colours in the Buchanan tartan are quite a bit brighter than this blanket. 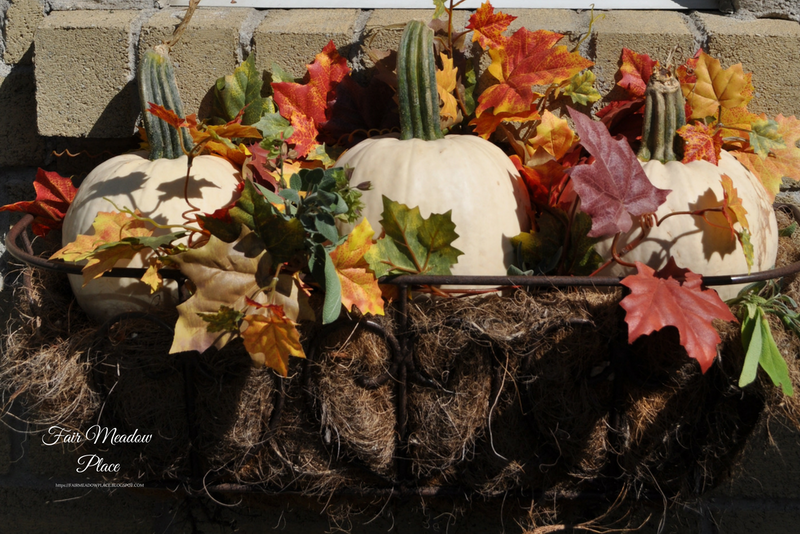 The window box holds three white pumpkins with some faux fall leaves. It is too early here to find fall leaves. 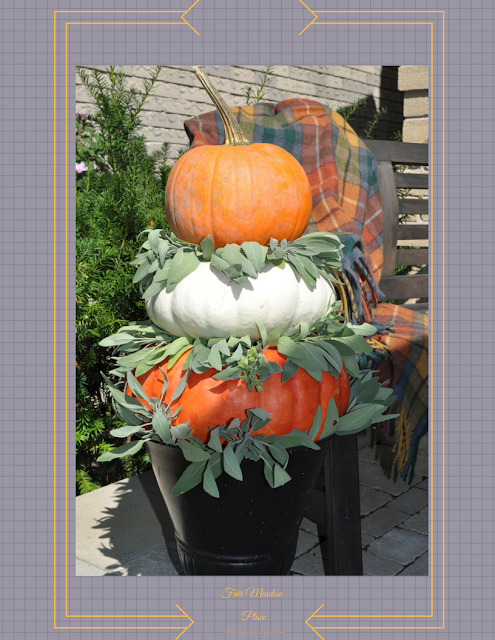 The pumpkins are stacked in a short black urn. They sit on cut garden sage and we have added sage between each pumpkin. The sage was readily available from the garden and gives the pumpkin stack more dimension and presence. This is an original Fair Meadow Place publication. 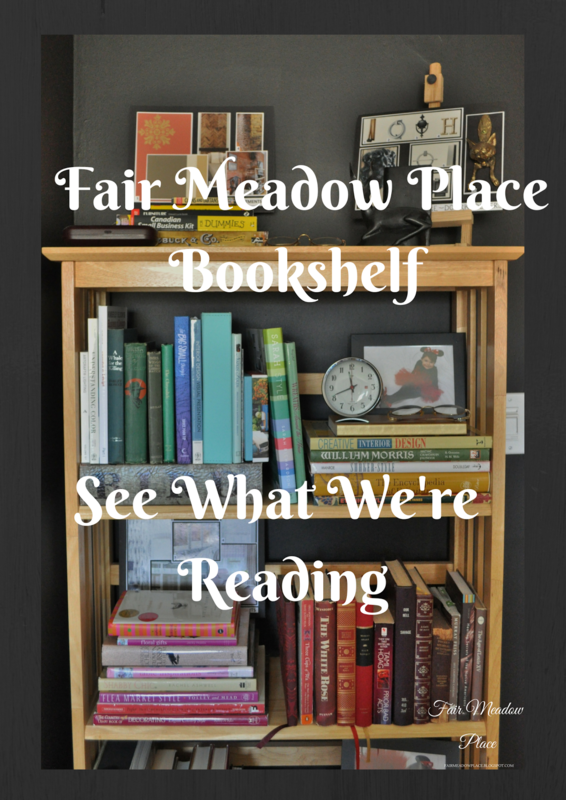 The best was to receive Fair Meadow Place Posts is by email. We enjoy hearing from you and welcome comments below. Oh Barbara, I love the triple pumpkins. I have to do that -- I have an urn. (Not black but it will be fine) and will be on the hunt. I tried to grow pumpkins this year and got nothing. Must not be sunny enough. I'll try again next year! 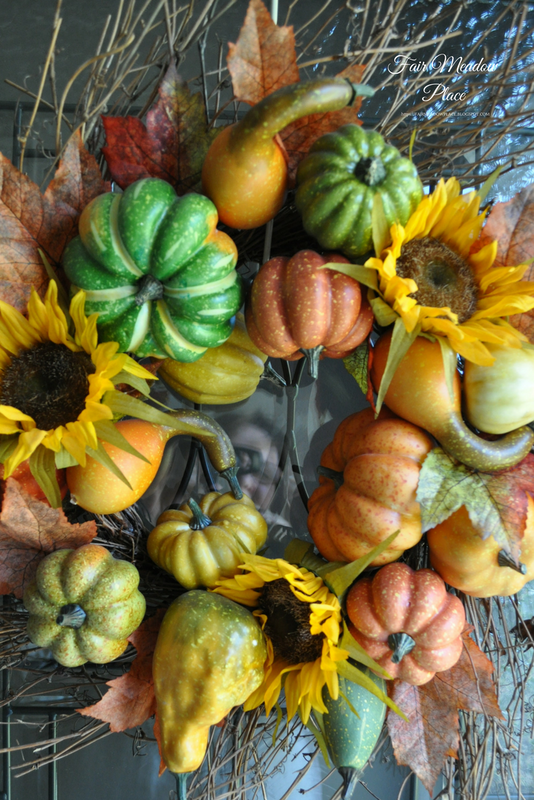 The wreath looks fabulous. Even though I'm not ready for fall, I love seeing this and getting such wonderful ideas from you. 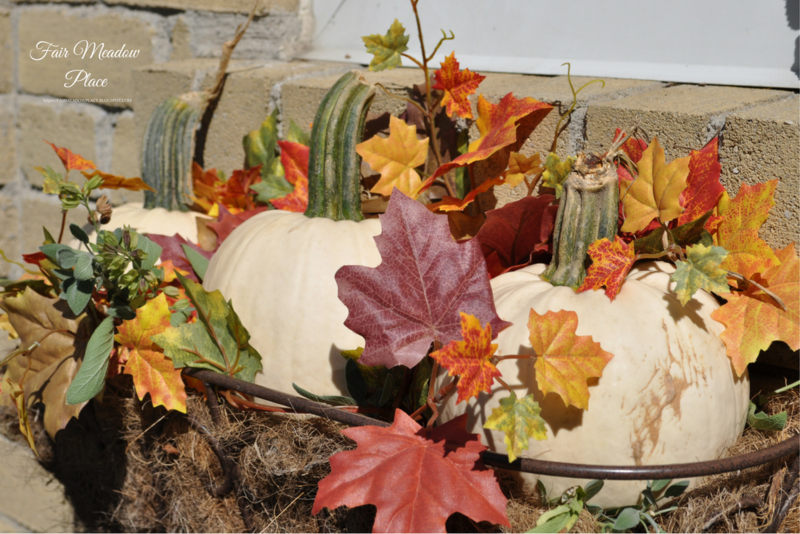 We grow pumpkins too, but they got such a late start this year. There are only a few. I will be buying them this year. I'm not ready for fall either, but I like to look at pictures ahead so I can plan out what I might do. So cute. 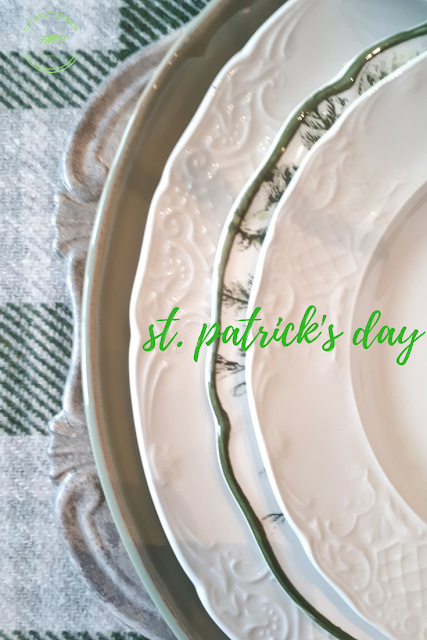 Thank you for sharing at Thursday Favorite Things. I love fall decorations and these are exquisite. Pinned and Shared. Thank you, Amy. I am glad you stopped by to say hello. Nice! 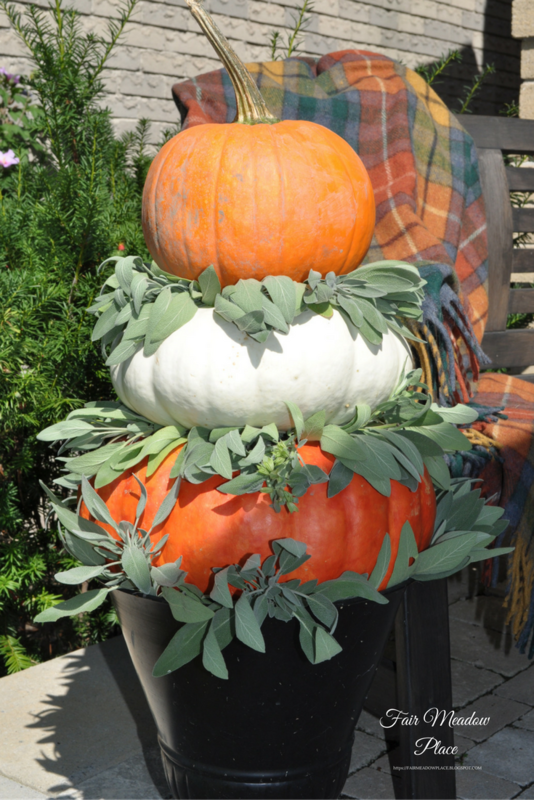 I love the stacked pumpkins with the sage best. I never would have thought to place the sage between each one but it is lovely. 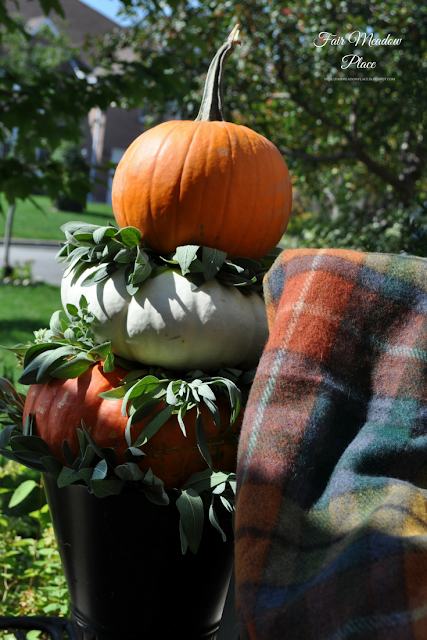 I also love the colors of the plaid throw on the bench. It all comes together so well. Thanks, Nikki. I had a lot of sage growing in the garden and somehow it ended up between the pumpkins. i love the sage and pumpkin topiary! how did you get it to stay securely? I didn't do anything to hold the pumpkins together. They are quite a good size and just seem to stay together under their own weight. Thanks for stopping by. 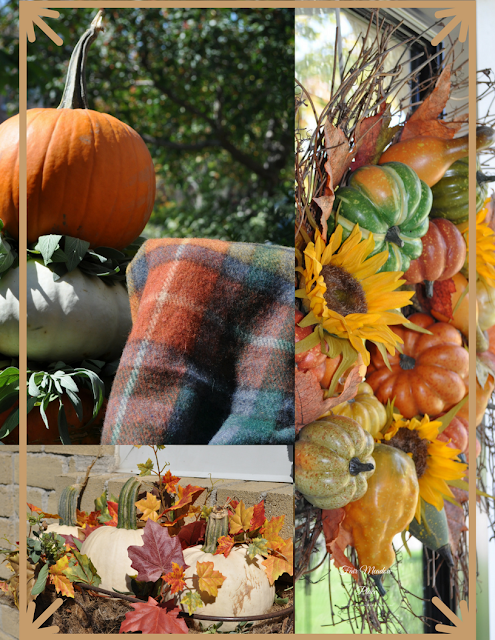 I love fall colors and decor. You've done a beautiful job on these, Barbara. Thank you, Christie. Fall is a beautiful time of year here. Thank you Angelique. I have been away and out-of-touch. I am just returning and have started to respond to comments. Thank you for the feature.